We invite you to join the rich tradition that has been enjoyed by thousands of young men in the Baltimore area. A Calvert Hall education is a transformative experience that continues long after graduation. Our students become Men of Intellect, Men of Faith, and Men of Integrity, and the relationships they develop over four years at “The Hall” are theirs forever. For the last 172 years, Calvert Hall has provided a Catholic college preparatory education in the Lasallian tradition. The mission of our founder, St. John Baptist De LaSalle, calls on us to be a school where academic prowess thrives, where young men are involved in their community, and where a brotherhood is created that will last a lifetime. As the oldest Christian Brothers school in the country, we are proud of our history and respect our traditions. We offer a mix of core, elective, honors, and advanced placement classes that teach each student to think independently, logically, and creatively. Learn More. We have several special programs that meet our students’ needs, abilities, and academic desires including the McMullen Scholars Program, the Br. Tom Miller Honors Program, the STEM Program, and the La Salle Program. Learn More. Our counselors assist our students with both their academic and social development, including plans for college and career as well as academic and social adjustment. Learn More. Explore the more than 50 clubs, student publications, community service organizations, and music and performance ensembles at Calvert Hall. There is something for everyone here! Learn more. Campus Ministry provides retreats, liturgical experience, community service and mission trips while developing young men spiritually, emotionally, and academically. Learn more. Gain a lifelong commitment to the creative arts and the world of imagination through our Arts program, which includes theatre, visual arts, instrumental music, and vocal music. Learn More. 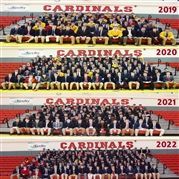 Competing in the Maryland Interscholastic Athletic Association (MIAA) in 17 sports with 39 different teams, the Cardinals have won over 125 boy’s high school athletics titles while garnering both regional and national recognition. We believe our sports attract athletes at every level. Some of our teams are highly competitive while others can be joined by simply walking onto the field or court. More than 500 students earned honor roll accolades for their efforts during 2018 first semester. Honor roll is awarded to students who achieve an academic average of 88 and does not have a grade below 81. Calvert Hall College High School is a private Catholic college preparatory high school for boys, located in Baltimore, Maryland. Our mission is to foster Men of intellect, Men of faith, and Men of integrity in the Lasallian tradition.